In the twenties, several inventors were unleashed in trying to obtain more sensitive and performing superheterodyne circuits. The Strobodyne invented in 1927 by L.Chrétien is, as the Ultradyne, one of the most original. Relate the strobe phenomenon with an RF mixer circuit may seem incoherent, but it is with this optical principle that Mr. Lucien Chrétien, French engineer and inventor of the Strobodyne, compared his mixer circuit. The stroboscopic effect is a phenomenon that, under certain lighting conditions, makes seem a rotating body stationary or rotating slowly in one direction or another. It's an optical effect due to retinal persistence. If a white colored disk with a black line drawn on it(see figure 1), was applied to the axis of a motor (that rotates clockwise) running for example at 1500 revolutions per minute, the black line would become invisible. This is attributed to the high speed of the motor. Suppose you turn on and turn off the light in the room, where the motor is, 1499 times a minute then you would see turning, in a clockwise direction, the line slowly on the disk at a rate of 1 revolution per minute (Fig.1B). If instead we change the "frequency" (On/Off) of the light by increasing it a bit, for example 1501 rpm, we would see the black line running counterclockwise at 1 turn per minute (Fig.1C). With an On/Off frequency of light at 1500 rpm, the line will appears fixed as in fig.1A. The frequency of rotation of the disk, which in the first example is 1500 rpm. and the light is 1499, gives as a resultant frequency: 1500 -1499 = 1, or in the second case; 1501 - 1500 = 1 turn per minute which is the visual or optical frequency that we perceive in the retina. The Strobodyne circuit is based on the same principle except that it is, of course, an electrical phenomenon which occurs in place of the optical one. The inventor compared the motor speed with the desired Receive Frequency and the frequency of light with the Local Oscillator, the difference between the two is the Intermediate Frequency. Perhaps the analogy is not the most guessed but L. Chrétien in his books, even in the most recent (dating from the mid 60), has always written, referring to his mixing circuit, of "stroboscopic effect". Moreover, he did another analogy with the "Ondograph", instrument invented by the French Mr. Edouard Hospitalier in 1902 that he also compared it to the stroboscopic phenomenon. This instrument was used to record graphically (ink on paper) oscillatory changes such as alternating voltages or currents, a sort of oscillograph. The Ondograph allowed to record fast phenomena at a slower rate, in practice it changed the frequency to be measured in a lower one using an electromechanical system, thus it performed a true frequency translation. Chrétien was talking also of sampling or interruption (make and break and découpage) of the frequency, the latter explanation is certainly more realistic. The principle of the Strobodyne circuit is as follows: to a receive frequency tuned circuit it is applied, in parallel or in series, an impedance or variable resistance whose value varies at a rate of the local oscillator frequency. This variation is nothing more than a fast rhythmic interruption of the desired signal which in practice produces the desired translated frequency which is selected and picked up in the intermediate frequency transformer. As you can see we are dealing with a commutating (or switching) mixer. One cannot not compare it to the Ultradyne circuit of R.E. Lacault where the RF signal varies quickly the internal resistance (plate/filament) of the tube. In Chretien's circuit it is, however, the oscillator signal which produces the variation or interruption and not that of the radio frequency. In his original circuit Chrétien used a triode, as shown in Figure 2. 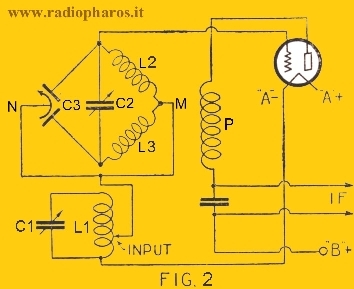 The RF signal, selected by L1/C1, is connected to the intermediate point M (this should produce a high rejection of the oscillator signal in the L1/C1 circuit and therefore in antenna) and sent to the control grid by means of the Wheatstone bridge consisting of L2, L3, C2 and C3, which are part of the oscillator resonant circuit, P is the feedback coil. The alternation of polarity of the local oscillator voltage that develops on the grid produces a wide variation in the internal resistance (in essence from zero to infinity) of the tube, in this case between the grid and filament. When the grid is positive, the RF signal is blocked, in practice it is grounded through the grid-filament low resistance. When the grid becomes negative, its resistance to ground is high, then the RF signal passes and is amplified, clearly the level of the local oscillator must be adjusted so that the negative voltage is not too high because this would block the amplification. Over the years, Chrétien has transformed his one tube Strobodyne circuit in a two tube circuit (see Figure 3). The first tube, a tetrode, is used as an amplifier/switch, the second is a triode, as an oscillator. The RF signal is sent, as usual, on the grid but here the voltage of the oscillator is injected into the plate through the primary of the IF transformer. This reminds us closer the Ultradyne circuit, but in the Strobodyne the plate is normally powered by the anode voltage, where the oscillator voltage overlaps. The average plate voltage is very close to that of the screen grid (point P in Figure 3). The oscillator wide level swing produces an increase or decrease, according to its polarity, of the plate voltage and varies the working point of the tube and, by exploiting the particular characteristics of the tetrode, passes alternately from the PQ area of the curve, where the RF signal passes and is amplified, to the OP, where the signal is interrupted (see fig. 3). This virtually results in a sort of short circuit at the ends of the intermediate frequency transformer, and then, according to Chrétien, produces the "stroboscopic effect" or perhaps I should say the ON/OFF effect. Even if it uses two tubes this second version is easier to implement than the first, but retains, in principle, the same characteristics and performance. Although having partly of the ingenuity and simplicity of the Ultradyne (1), the Strobodyne was certainly a very interesting mixer circuit and were the two circuits, one dated 1924 and the other one 1927, forerunners of modern switching mixers. 1- In reality, the Strobodyne is based on the same principle of the Ultradyne, namely it uses the tube as an automatic switch to interrupt rhythmically the RF signal or that of the OL, in order to create the IF. Perhaps L. Chrétien was inspired by the work of R.E. Lacault and tried to perfect the idea, in that time they knew each other and had worked together. 2- The Strobodyne mixing circuit is often erroneously credited to Lacault. He sponsored and introduced it to the United States in mid-1927 by translating from the French the Chrétien's technical articles and published them in the Radio News magazine, also by building a receiver with this system adapting it to American components. In the USA there was also a production of radio receivers, cured by Lacault, that were called Strobodyne. In France there were several radios manufacturers who adopted the Strobodyne system, as Bouchet et Aubignat, C.A.R.A.C. and O.R.A. 1- "Method and apparatus for changing frequency for radiosignaling" - US Patent released in June 21, 1932 - N° 1,863,564 - Filed January 14, 1928, in France patent requested in January 15, 1927.